Visit the archaeological sites of Chichen Itza, Coba, EkBalam and Tulum. Meet a legendary culture. We help you arrange your excursions. White sand and turquoise waters. What are you waiting for? All inclusive hotels, downtown hotels, boutique hotels, apartments and hostels. It’s your choice! couple or friend not diving? From May to September, the world biggest fish at your fingertips. As great as harmless, this magnificent animal visits us every year. Ancient caves full of stalactites, the clearest waterand beautiful light effects. We dive them all! Welcome to Playa Diving Center, our dive center located in Playa del Carmen-México. 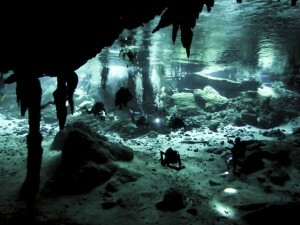 We’ll take you diving to the best of the Caribbean Sea, Cozumel Island and the amazing cenotes. Playa del Carmen offers lot of fun for divers of all levels, based on the different locations:reef diving in Playa del Carmen, Cozumel Island and the caverns called cenotes, probably the best diving in the area and a unique diving experience in the world. You will enjoy a relaxing and friendly atmosphere in Playa Diving Center, we like to say that you come as a guest and leave as a friend. We do our best to make it real.Anything is possible: training for beginners; new challenges for intermediate levels and technical training for expert divers. We’ve been working in Playa del Carmen for more than a decade, thousands of divers have passed through our hands, and many of them have come back year after year. Our instructors have years of experience in reef diving and Cenotes in Playa del Carmen. 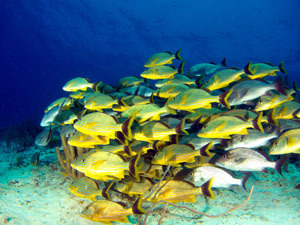 Playa del Carmen coral reef has dive sites from 10m/30ft to 30m/100 ft depth range. It belongs to the second largest reef barrier in the world. Corals, gorgonians, sea turtles, sharks and a variety of Caribbean fish as parrotfish, sergeant fish, tarpoons, barracuda, butterfly fish, moray eels, crabs, lobsters and more. In summer we snorkel with the whale shark and we dive with the bull shark in winter. For the most demanding divers, Cozumel island near Playa del Carmen offers spectacular wall dives, enjoying a great visibility most of the days. You will be amazed with its beautiful and colorful coral formations. The jewel of the Caribbean. You will find in Playa del Carmen impressive Mayan archaeological sites, Biosphere reserves, theme parks and a nice and casual nightlife at the famous Fifth Avenue. We help you to organize your excursions to make sure you get the most out of your vacations. We will do our best to make your diving holiday in Playa del Carmen the best of your life.